Passport Potash, Inc. has signed a letter of intent to enter into binding agreements under which NZ Potash, LLC will sell to Passport its 50% ownership interest in HNZ Potash, LLC. Passport and HNZ Potash will strive to jointly develop their combined potash properties in the Holbrook Basin. 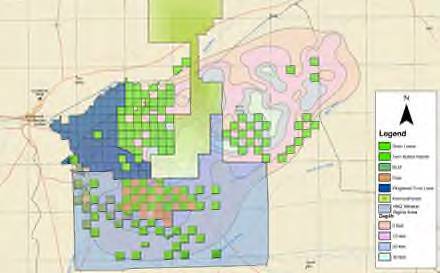 When combined the properties will contain over 200,000 acres of mineral rights and will cover over 300 square miles. Following the release of Passport's NI 43-101 from SRK containing an exploration potential, the Company intends to jointly prepare an NI 43-101 resource report with HNZ Potash. Exploration activities of the combined companies that have been completed to date consist of over 50 drilled wells and over 100 lines miles of 2D seismic. To view the combined properties, please click on the following link: http://passportpotash.com/images/map/LandStatusMap.pdf. I am not sure if readers understand the potential of this LOI. What it means is that Passport is negotiating to take over NZ legacy 50% so in the end it will be a 50/50 JV between Hunt OIl (currently nz legacy partner) and Passport. Passport is a public company, ticker PPI. Hunt Oil is a private company. If institutional buyers/funds etc want to be part of this project, assuming the LOI ends up a JV, then the only way for investors to be part of this future potash mine(s) is to purchase PPI stock on the Canadian venture exchange. This is fanatstic news today and as a long time PPI shareholder I am happy to see movement towards a major consolidation of lands. This is very exciting long term news! IMO if you've got some $ hanging around, this would be a good place to let it ride!